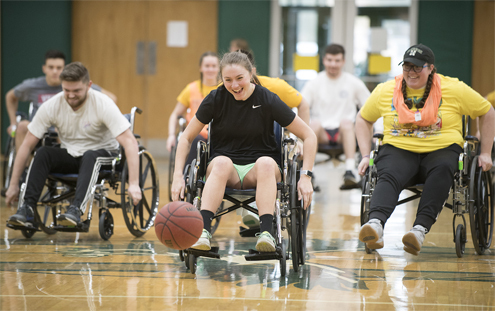 Bangor, Maine - Husson University’s Organization of Physical Therapy Students (OPTS) is hosting the 21st Annual Wheelchair Basketball Tournament at Newman Gymnasium at One College Circle in Bangor, Maine on Saturday, March 30, 2019 from 12 – 4 p.m. Teams comprised of Husson University physical therapy (PT) and occupational therapy (OT) students will be participating in this event. Also participating will be a team of alumni and staff members from Husson University’s Advancement department. Two physical therapy businesses are sponsoring the alumni team this year. They are Performance Physical Therapy and Kidz in Motion. Brad Libbey, DPT, Class of 2013 owns Performance Physical Therapy. Karen Huhn, PT, PhD, chair of Husson University’s School of Physical Therapy, owns Kidz in Motion. The event is free and open to the public. Those in attendance will enjoy multiple games of wheelchair basketball. Food, drink and raffle ticket purchases all support Alpha One and the scholarship fund for PT students. Local area businesses are donating the raffle prizes. While this year’s slate of prizes is still being determined, in past years prizes have included gift cards to area restaurants, hand-made pottery, hand-made organic lotions and soaps, a bicycle, and much more. Anyone attending this event can purchase raffle tickets. Individuals must be present to win. Raffle tickets cost $1 for one, $4 for five, $7 for 10 and $10 for 15. In addition to being fun, this competition serves an important educational purpose. It provides Husson physical therapy and occupational therapy students with a greater appreciation of the mobility challenges confronting the physically disabled. Persons with mobility issues will someday be the future clients of these Husson PT and OT students. If you need more information about the event, please contact Maxell Post via email at postm@husson.edu. Husson University’s Organization of Physical Therapy Students promotes academic excellence, public service, and professional networking through a series of meeting and fundraising events. The group is dedicated to promoting healthy life styles, raising awareness of disability-related issues and encouraging professionalism within the discipline of physical therapy. OPTS members are all students in the School of Physical Therapy at Husson University. This School is dedicated to developing skilled and knowledgeable practitioners who can work with clients on an independent and collaborative basis. Husson’s Doctor of Physical Therapy program consists of a three-year pre-professional phase, followed by a three-year professional phase. The School of Physical Therapy is part of Husson University’s College of Health and Education. Offering degrees in counseling, nursing, physical therapy and occupational therapy, the College of Health and Education helps prepare students for professional success in a variety of healthcare careers.